Everybody who has lived in this glorious state knows that during this time of the year can be very confusing, especially for women, we’re searching for the perfect fall outfit and the weather isn’t our friend during this time. Ladies, you know what I’m talking about, in the morning it’s a crisp 50-something degrees and then by lunch time it’s a sweltering 80 degrees with no breeze. I don ‘t know how many times during my college years that I’ve had a mixture of both summer shirts and fall sweaters creating an impressive collection in the back seat of my car. I’d like to report that it doesn’t matter if I’m in college or have “a big girl job”; those sweaters are still showing up in my back seat. Apparently old habits really do die-hard. To sum it all up, during this time of the year, the weather can be very indecisive. What does this mean for your home’s foundation does this mean that because of the constant changing of the weather, termites and other pests aren’t active? The answer to that question might surprise you. Let’s talk about creepy crawlies, termites to be more precise. One would think that during the warmer months termites would be the most active, that’s not one hundred percent true. According to our friends at Termite & Pest Control, these little guys-and gals, are active twenty-four hours a day and seven days a week, they don’t clearly they’ve never heard of labor laws. While they’re usually more active around the spring, field professionals like to refer this as “Swarm Season” they still can wreak havoc during the cooler months and one of their favorite snacks is your home! So what can you do to protect your home from any pesky or unwanted pests, thanks to our friends at S&S Termite & Pest Control we’ve got some suggestions for you. While Scott Ballard, the Director of Operations, recommends “you really should leave it to the professionals” he’s given us things that we should be on the look out for as well as suggestions to help prevent nasty intruders. Be on the lookout for bugs and try to identify them, some people whose homes have infestation report that they’ve seen flying ants around. These most likely aren’t flying ants but what professionals call “swarmer” termites. Also look out for softness in baseboards, door and window frames, as well as bubbles in the drywalls. While these individually are problematic, combined together only increases the chance of your home being infested. You should be aware of your surroundings when trying to prevent an infestation. Keep an eye out for wood on the ground or any wood that may be making contact with your home; examples of this are woodpiles, mulch, and other unnecessary debris. Another thing to keep an eye out for would be any excess moisture around or under your home, termites thrive in moisture and with Alabama weather, moisture is a given year round. Just like people, they need food, shelter, and the proper temperatures to have a successful life. While termites are terrible pests and can cause major problems to your homes foundation, there are other pests that need to be addressed. While mice and other rodents typically stay out of your home during the warmer months, it’s when the weather starts to turn a little cool that they try to make their way into your home. I know my family had a terrible run in with a nest of squirrels that cost them almost $6,000 in damage, flooding a good portion of one upstairs bedroom and the downstairs laundry room. So to prevent your home from any unwanted invaders put steel wool in any area that looks big enough for a rodent to go through and seal it with great stuff. Mice specifically need a hole the size of a dime to get access into your home, so it’s important to be very thorough in your examination of your exterior. These pests are just a few of what you should be keeping an eye out for this year; if you’re unsure please seek out a professional to have them come take a look. 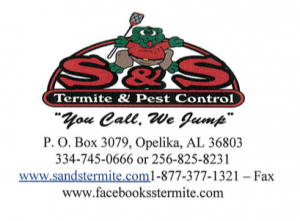 Crawford Willis Group recommends our friends at Termite & Pest Control. These people have excellent customer service and are always willing to answer any questions that you may have, I know they’ve always been quick and eager to respond to any messages that I send their way. A huge thanks to Scott Ballard of S&S Termite & Pest Control for giving me great advice in how to approach this topic and for answering all of my questions about termites, these guys really know their stuff!